I’ve been in “Getting Ready for Summer Break’ mode for the last couple of weeks. We’re wrapping up our home school year. I’m getting our summer stuff out and trying to figure out how best to organize it. As I’m getting our home and vehicles switched over to summer readiness I’ve been making a list of all the things we need. Topping that list is a pair of prescription sunglasses for myself. For years I’ve been keeping everything related to our vision needs in a file folder. It works, but it can be hard to find the information I need quickly. 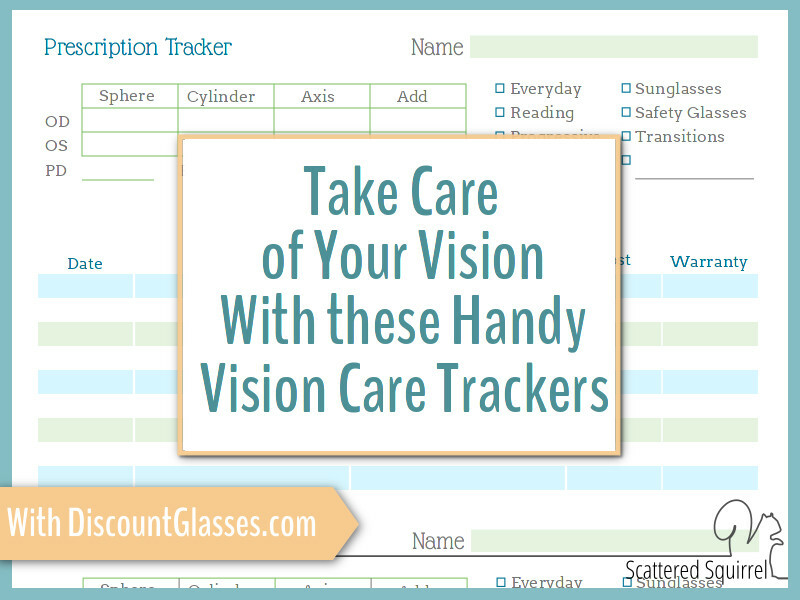 To help make it easier and faster to find the pertinent information I created a Vision Care Tracker that I can tuck into my home management book. I’ve only had to wear glasses full time for just over a year now. When I purchased my first pair last year I honestly wasn’t thinking about summer and the need for sunglasses. Besides, it seemed to me like my prescription was so mild I could easily get away with just wearing my normal sunglasses. Mild or not, my eyes really need the prescription lenses. I can feel the strain when I go too long without wearing them and if I push it too far I end up with a migraine. On the other hand, too much time squinting without sunglasses can cause headaches for me too. Normal sunglasses just won’t cut it this year. Last year I learned the hard way that I need prescription sunglasses. This year I’m determined to make sure I’m prepared ahead of time. I have less than a year until my next eye exam and without knowing whether my prescription will change or not I really don’t want to be spending a fortune on sunglasses. So, it was a happy surprise when I checked out Discount Glasses and found their prices to be extremely reasonable. I’m really picky about sites I’ll shops on. I like to take my time to research, see what other people are saying. If I find that it sounds like a decent site, I’ll hop over and spend a little time on the site, checking everything out. Three things really set this site apart from other glasses sites I’ve checked out. 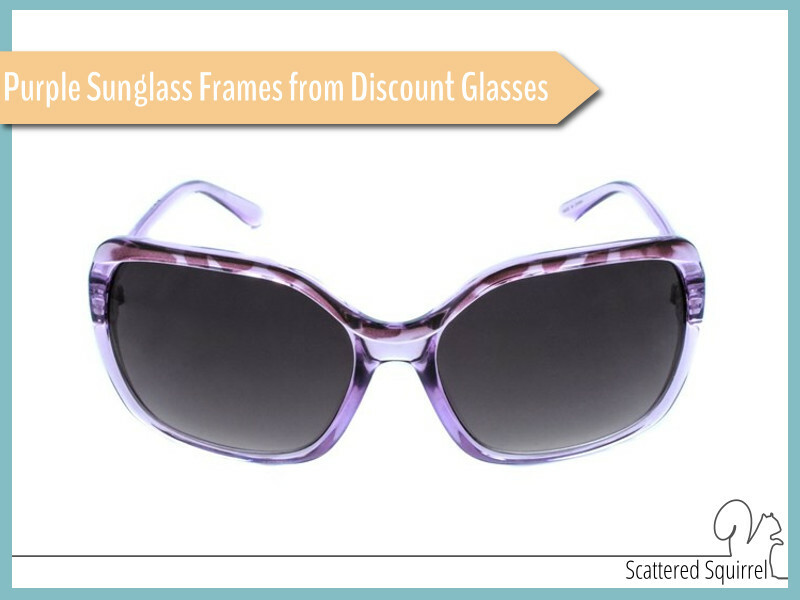 Discount Glasses has a wide selection of frames. I probably could have spent a few hours searching through them all, but their filter options were spot on for narrowing things down to what I wanted. After you click on a category, down the left hand side are various ways you can customize your search. My favourite one was using the sizing sliders. Nothing worse that finding a cute pair of frames that you totally love, only to find out they won’t fit you. So being able to limit my search to frames that would fit was awesome. It will also be a great time saver for future visits. I also loved the diversity of their frame selection. I saw some well known brand names mixed in with brands I never heard of. Prices for frames ranged from $10 to $90 so there was definitely a little of something for everyone. The second feature that I absolutely love about Discount Glasses is that they offer free shipping in the US AND Canada. Who doesn’t love free shipping? I actually spent quite a bit of time on their Shipping page because I just couldn’t believe that they shipped to Canada for free! Not only that, I couldn’t find the minimum amount I had to purchase to get the free shipping. I ended up reaching out through their live chat to find out. Guess what? No minimum! No-one does that! Since most purchases from places in the US usually mean paying some customs fees before delivery, saving on shipping is a really nice surprise. Let’s face it – shopping online can be a bit of a gamble. We’ve all heard horror stories about someone who ordered one thing and received another. One of the first things I look for on any site is their return policy. Being informed before shopping is always a good thing. If the Free Shipping surprised me, the free returns knocked my socks off. Not only will they pay for the shipping to get the product back to them, but you have a whole YEAR to return an item. Knowing there is a policy like that in place, brings me peace of mind when I’m shopping. It was also very clearly spelled out, which I appreciate because some return policies can be convoluted and hard to understand. After I found some frames I liked the real fun began. I needed to go grab my prescription. I keep all our vision care paperwork together in one folder. With three of us needing glasses, the file is getting a little full. I found myself feeling frustrated that I couldn’t just quickly look up my prescription and be done with it. That’s when it hit me – what I needed was a place to record it in my home management notebook. I know I could just as easily have used note paper to just jot stuff down, but where’s the fun in that? They didn’t take long to make and I know that there are some of you who will be able to use these too. Because there is so much time between appointments, it’s nice to be able to quickly see when the last visit was. As you can see I kept it really simple. 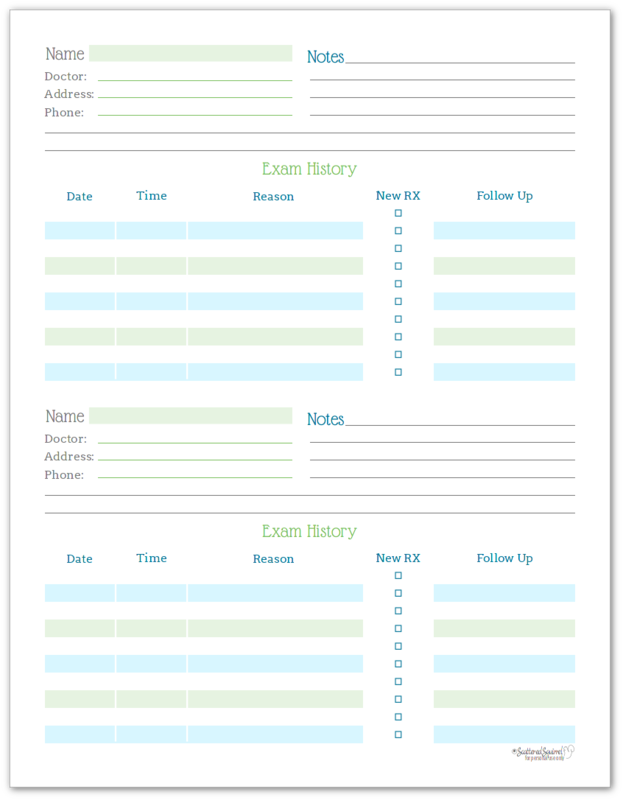 Just a place for the family member’s name, doctor’s name and contact details, and then space to record visits. The second sheet is the one I made first. I wanted somewhere to jot down our prescriptions for quick references. 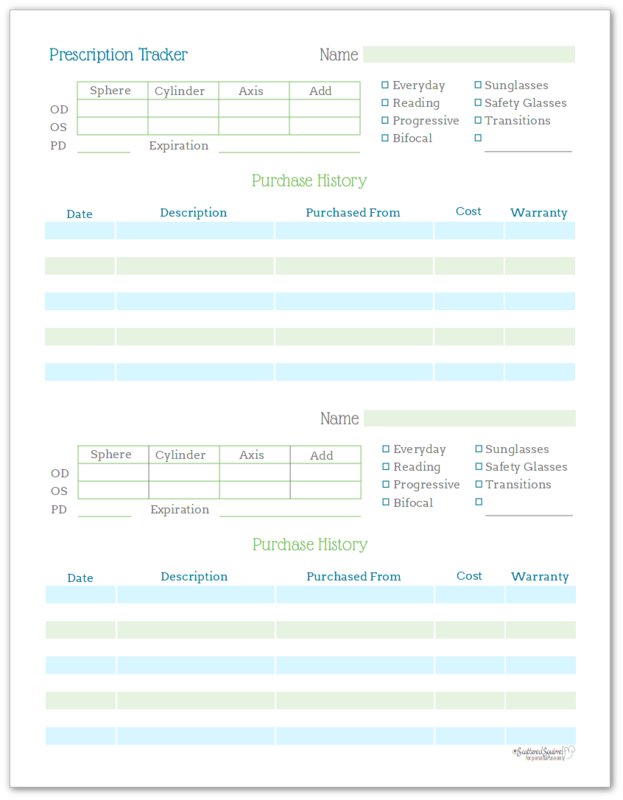 In addition, I also wanted a place to be able to keep track of our glasses purchases and whether or not they came with a warranty. We don’t purchase glasses often, so knowing how long we’ve had our current pairs seemed like a good idea. In true scatter-brain style, I stopped what I was doing to make up the printables. So, once I made them and printed them out I headed back to finish up my shopping. A quick glance through the frames again and I think I’ve narrowed them down to these ones. I like that they’re fun and the lenses are large. Especially for sunglasses. Now I’m debating on whether I need polarized lenses or if I should just stick to normal ones for now. I’m leaning towards normal for this pair. Surprisingly though, even with the added cost of the polarized lenses, these will cost me less than half what my every day glasses cost, and I got those frames on sale with fairly basic lenses. I can’t wait to order these and check them out. I’ll be sure to keep you posted on how I like them. Eye health is something that is very important to my family. With three out of four of us needing glasses to correct vision problems, it’s really important to me that we stay up-to-date with our exams and prescriptions. It’s equally important that we not have to take out a small loan to ensure that we’re looking after our eyes. Knowing that there is a place out there like Discount Glasses that will help me save some money on frames and lenses is really nice. Do you or members of your family wear glasses? Have you ever ordered from Discount Glasses? Drop me a line in the comments and let me know. It is on my list. I’m working a bunch of printables for a Health section, I should be able to start sharing them on the blog soon!